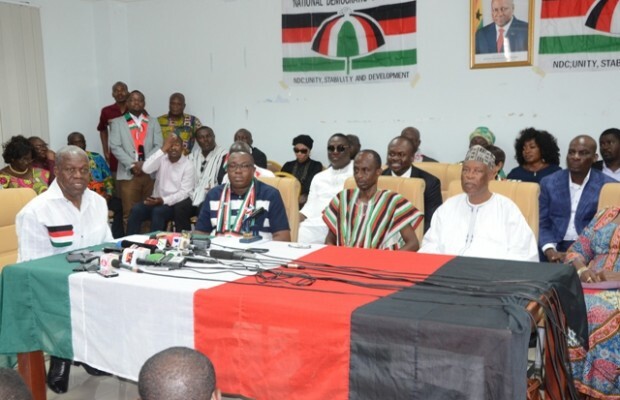 The National Democratic Congress (NDC) yesterday fired the accountant who released presidential nomination forms to George Boateng, the man who has vowed to unseat President John Dramani Mahama at the party’s presidential primary. Another party officer, popularly called WO, an administrator thought to have had a role in the nomination forms brouhaha, has also been showed the exit from the party. But George Boateng insists he will go ahead with his campaign for endorsement with the same forms because they are authentic. The party’s action is the culmination of a flurry of activities, including an emergency meeting held on Wednesday to decide on punitive measures to dish out to whoever made it possible for George Boateng to lay hands on the nomination forms. NDC General Secretary, Johnson Asiedu Nketia aka General Mosquito, in his continuing duel with George Boateng, the man he had described as ‘mad’, told the media yesterday at the party’s head office in Accra that the nomination forms were fake. George Boateng, who is the Youth Organiser of the party at Oyarifa near Accra, has denied that the nomination forms he picked are fake, claiming that “there is a grand scheme to make it impossible to challenge the president.” He insists that he is determined to carry out his ambition of contesting President Mahama. Asiedu Nketia said the purported sale of presidential forms to George Boateng was fraudulent and was not recognised by the party because he (Asiedu Nketia) had not authorised the issuance of the said forms. “In the case of the presidential nomination forms, we indicated that the forms must be picked from the General Secretary of the party. I have always been in-charge of the nomination forms and I haven’t issued them to anyone; the party’s national treasurer, who should also confirm payment for the forms by anyone, has no such records. “Our forms come in our party colours embossed on them. To maintain utmost security of the forms, at anytime anybody buys the forms we also emboss our party’s official seal on them and all the pages are initialled by the General Secretary so that nobody can fake the forms or make copies and present them to us as our official documents,” he said. He also disclosed that the forms sold to Mr Boateng by the said accountant, who had been working at the party headquarters for more than 20 years, was a draft which was in black and white. He urged all party members who have the ambition to contest in the party’s presidential race to carefully weigh themselves before declaring the intent. He said apart from the requirements imposed by the party, including one being a party member of good standing for not less than 10 years, the 1992 Constitution of Ghana also imposes additional requirements such as a minimum age of 40 years and the need for the person to be of sound mind. George Boateng was in the news this week after picking nomination forms at the NDC’s headquarters to challenge President Mahama for the presidential nomination of the NDC for the 2016 election. He pledged to legalise the cultivation and exportation of marijuana (wee) to raise foreign exchange to fast-track the country’s development. Meanwhile, Vice President Kwesi Amissah-Arthur has picked nomination forms on behalf of President Mahama for the latter to contest the party’s presidential primary come November 7. Mr Amissah-Arthur picked the forms at the party’s multi-million dollar head office at Adabraka, Accra, with a team made up of Dr Edward Omane-Boamah, Communications Minister; Haruna Iddrisu, Employment and Labour Relations Minister and Joseph Nii Laryea Afotey-Agbo, Greater Accra Regional Minister. The Vice President, who appears to maintain his position as running mate upon the confirmation of his boss as NDC candidate for the 2016 polls, was met by Mr Asiedu Nketia; Vice Chairman, Samuel Ofosu Ampofo; Alhaji Mahama Iddrisu, an elder of the party; the Treasurer, Alhaji PMC Abdulai and the Deputy General Secretary, Koku Anyidoho. He was also welcomed by a multitude of party supporters who were clothed in party colours and chanted (party) songs. The supporters seem elated about Mahama’s decision to lead the party in the next elections. Asiedu Nketia briefed the vice president on the procedures involved in filling and submitting the nomination forms and asked him to make a cash payment of GH¢1,000 for the forms. The vice president, after picking the forms, said the president was ready for any internal contest. He was optimistic that the president would beat any contender on November 7. General Mosquito made it known that President Mahama was the first to have approached his office to pick up nomination forms.